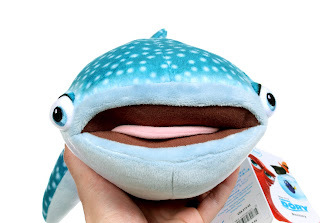 Today my Finding Dory Disney Store plush reviews come to an end with the very last one in my collection...Destiny the near-sighted whale shark! 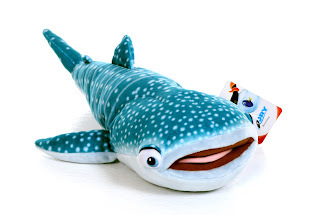 If you've been following along, you'll know that I've been reviewing the entire Disney Store exclusive Finding Dory plush assortment over the past couple weeks. 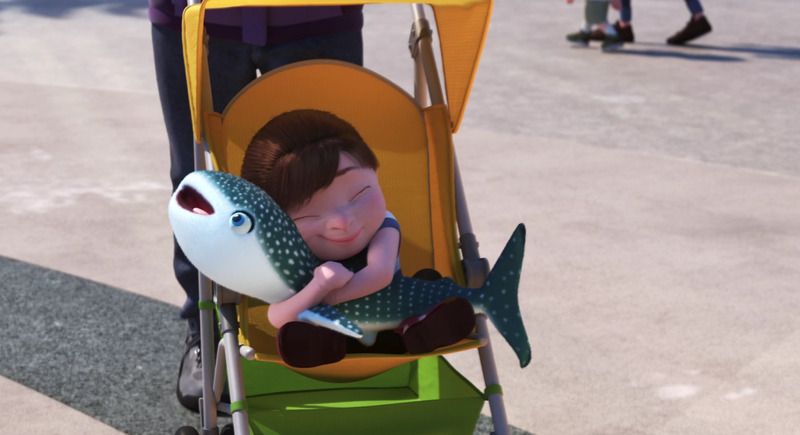 If you haven't already, be sure to check out my other detailed posts featuring Hank, Mr. Ray, Crush, Jenny & Charlie, Nemo, Bailey, Baby Dory, Sea Otter, Marlin and the sea lion trio. 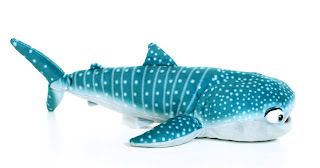 Did you know that Destiny plushies, very similar to this one (planned much? ;), can be seen in Finding Dory? As shown in the screenshot above, you can see a child holding one when Marlin and Nemo escape the gift shop fish tank (they can also be seen in the background on display in the shop). 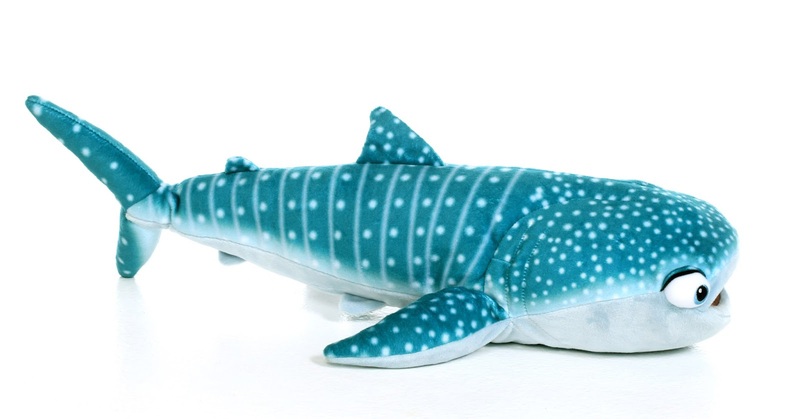 Destiny is about 22" long and roughly 12" wide (fin to fin). Her sculpt is pretty cute with nicely stitched embroidered features (including the standard "Disney Store Genuine Original Authentic" patch on the underside of her tale) and is very soft. I really love the vibrant materials used to create this plush and I especially like her opened mouth and floppy tongue. As the Disney Store always says, the "magic is in the details!" Retail is $19.95. With the holidays right around the corner, be sure to pick this up at your local Disney Store (or online HERE) before it's gone. As of today she is only $12.00, which is 40% off the original price. Not bad right? Be sure to let me know what you think of this fun Destiny plush and the rest of the Disney Store Finding Dory collection in the comments below!